Peter Kelly Tripucka was born February 16, 1959 in Glen Ridge. His father, Frank, was a pro football quarterback who had starred at Notre Dame in the 1940s. After Kelly was born, Frank left his job as a player-coach in the Canadian Football League and joined the Denver Broncos of the newly formed American Football League. Kelly grew up in Bloomfield and was the star of the Bloomfield High basketball team. The 6–6 forward scored more than 1,000 points as a senior. Later he was named New Jersey’s High School Player of the Century. Kelly was recruited by his father’s alma mater and made the varsity basketball team as a freshman. He led the Fighting Irish in scoring each season from 1977–78 to 1980–81, playing in the NCAA Tournament each year. At the 1979 tournament, Notre Dame was the top seed in the Mideast Region—ahead of Magic Johnson’s Michigan State squad. He averaged 15.4 points a game and earned All-America recognition three times. Kelly was selected in the first round by the Detroit Pistons in the 1981 NBA Draft. The Pistons were going through some lean years, but this gave Kelly a chance to move right into the starting lineup. He averaged 21.6 points as a rookie and played in the NBA All-Star Game. The following season he fought through injuries and boosted his scoring to 26.5 points per game. Kelly played five seasons for the Pistons, manning the guard and small forward positions as the club slowly built up its talent. He was a consistent 20-point scorer. With young Isiah Thomas and Joe Dumars making up a Hall of Fame backcourt, the Pistons decided they needed a big-time forward. 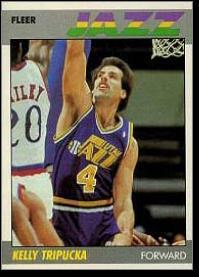 They traded Kelly to the Utah Jazz for Adrian Dantley. Kelly found himself as the third wheel to John Stockton and Karl Malone, and was relieved when the team exposed him in the 1988 expansion draft. He was selected by the Charlotte Hornets, where he once again averaged over 20 a game. Kelly played two more seasons with the Hornets before playing a year in Europe at age 32. He tried out for the Nets in 1992 but failed to make the team and decided to hang up his sneakers. Kelly turned his attention to the broadcast booth, where he covered Pistons games for the next eight seasons. In 2001, he joined the Nets broadcast team. He moved across the river in 2008 to work for the Knicks, first as a TV commentator and then as a scout. Kelly’s son Travis was a standout Lacrosse player for the University of Massachusetts.